1" to 1/4" in height. 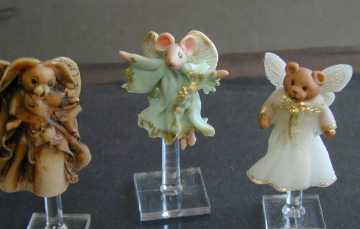 Each of these angels used the same basic pattern as Delphine with some variations. Benny the bunny angel is made using the same pattern as Delphine with a bunny head. After it was baked I antiqued it with a dark brown oil paint and wiped it off. I did a number of lady angels with various coloured outfits and the antiquing gave an interesting effect. Gus, the mouse, is my favorite angel, after I added the body to the top of the metal tip I rolled out a couple of legs and attached them so that they would show underneath. I used edging scissors for the gown and sleeves after the cernit was put between two layers of wax paper. I added gold powder with a brush for detail before it was baked. Sweet William, the bear angel, has gold powder accents and a teddy head and arms. A bit of blush was added to his cheeks before baking to give a more angelic appearance.